Performance, music, and art have deep roots in the unique creative landscape of Los Angeles. New experimental power trio (Marnie Weber, Dani Tull, & Doug Harvey) Faüxmish is sure to be a part of this legacy. Faüxmish is celebrating the release of their debut LP & CD ‘F for Ache’ with their debut public performance at Human Resources in Los Angeles on September 2nd. More info here. 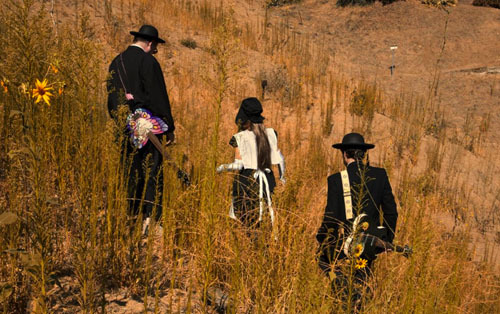 Faüxmish is a Los Angeles art-rock supergroup that came together over a shared engagement with American spiritual sects who remove themselves from established social norms and create their own culture as outsiders. Taking as their motto “Simplicity Through Noise,” Faüxmish have developed a practice rooted in improvisational ensemble playing using electric guitars (played with rubber mallets and other extended as well as traditional techniques) and vintage synthesizers, in various combinations of three. Initially conceived as a ‘wall of sound,’ the group’s music rapidly developed a complex and idiosyncratic audio vocabulary drawing on the members’ widely divergent individual musical backgrounds, which range from noise to prog, post-punk to film scores, and 90s alt-rock to improvisational audio collage. The results range from dreamy ambient soundscapes to theatrical rock songs.